Almo Nature HFC - Raw Pack is a raw meat diet for cats, which consists solely of pure ingredients. This food is available in 8 different flavours. Almo Nature presents the HFC Raw Pack for adult cats. These meat and fish meals are a delicious and conscious choice for your cat with high quality-ingredients. The fish is caught fresh from the sea (not farmed) and the meat comes from free-range animals (also free of hormones and antibiotics). The meat and fish is packed raw, after which it goes through the sterilisation process at high temperatures. This preserves both flavour and nutrients. Almo Nature HFC Raw Pack is rich in stock, which naturally encourages the cat to drink more. There are no additives, chemical preservatives or other additives added. Almo Nature recommends giving your cat a daily mix of 60% wet food and 40% dry food, for a 100% nutritional balance. Raw Pack is packaged in a 55g pouch and comes in packs of 24. 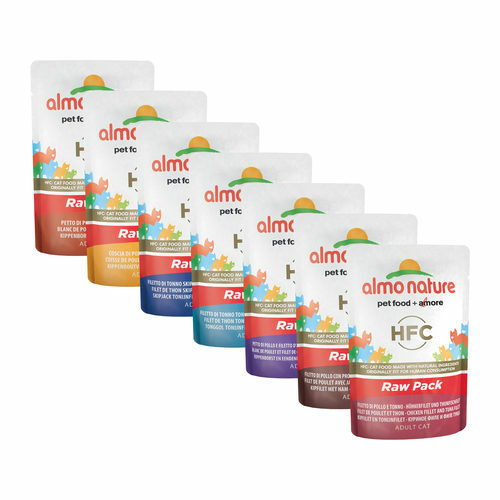 Have you used Almo Nature HFC - Raw Pack before? Let us know what you think about this product.